Active – Select to activate shipping profile. Profile Name – Enter a descriptive name. Pricing Rule – Enter rules using the syntax below. Separate expressions with semicolons (no spaces) and place rules on separate lines for clarity. Notes – Use to document rules. 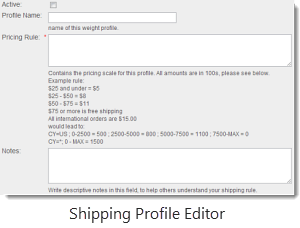 Shipping Profiles can also be created using Quick Setup in the Product Editor. Both active and inactive profiles display in a pricing field. If you choose an inactive shipping profile, customers will not be charged for shipping. CY=*; (Outside United States) If you have different shipping prices for overseas, specify those on a separate line. See instructions below to specify which countries you will ship to. Example – State=HI; or State=AK; If shipping costs vary for some states, you will need to add additional information. 15000-MAX=0; Enter a purchase range to the left of the equals sign. Enter the associated shipping amount to the right of the equals sign. Values are expressed in cents and do not use decimals. Use MAX to indicate all values larger than the entry to the left of the dash. Pricing Rule - Based on the criteria in the variables below. $200.00 and above is $40.00. If you ship internationally, you can limit the countries you allow shipping to in Global Settings. Users will not be able to order from restricted countries. You can designate these restrictions in Global Settings. Follow the steps below. In the Shipping to Countries field, enter the country codes of countries you deliver to. Refer to the List of official country codes. Remember to include your home country. Separate the country codes with commas.